Egg foam is one type of foam that is used as a sound damper in the room. This foam is usually applied to the music studio room, karaoke room, recording studio, meeting hall, meetting room, generator engine room. This egg foam is made from polyurethane foam which has the ability to muffle the sound so that no noise occurs. In addition to being able to reduce the sound of egg foam so that no noise occurs, it is also suitable to reduce echoes or echoes. There are so many models and specifications of foam eggs, to get various types of foam eggs that match what you want, you can get it directly through suppliers, distributors, dealers, agents, importers and all sellers in Indotrading at the lowest price with the best quality in Indonesia. Do you want to buy Egg Foam? Pyramid foam and foam can be installed on doors, doors, ceilings and others to manage sound, vibration and echo effects.We provide foam pyramids and foam in several sizes, thicknesses and colors. APAKAH ANDA SUPPLIER Egg Foam? Egg foam has a profile like the place where the egg functions as a sound damper that can be specifically designed for both the forming material and its size. 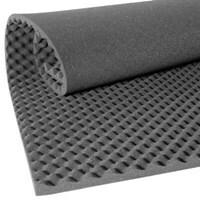 This foam is effective in propagating sound vibrations that exist to minimize sound leakage in the desired room. Egg foam is usually used as a coating outside Rockwool for a better appearance. Busa Telur Kotak Foam Reducer / Acoustic Foam Available in sheet form dimensions 50cm x 50cm thickness.5cm Application for: - Broadcast studio - Concert hall - Recording studio - Places of worship - Audiophile room - Karaoke Place - Home theater etc. In Indotrading there are many types and sizes of the most complete in Indonesia. All products are sold at supplier and distributor prices that are in accordance with the seller's purchase price for example to be resold at the foam egg shop or for their own needs. Is your Company engaged in selling Egg Foam to Indonesia. Please Register your company here.